Board of Intermediate and Secondary Education Multan was established on 30th March 1968. It is now being governed under the Punjab Boards of Intermediate and Secondary Education Act, 1976. 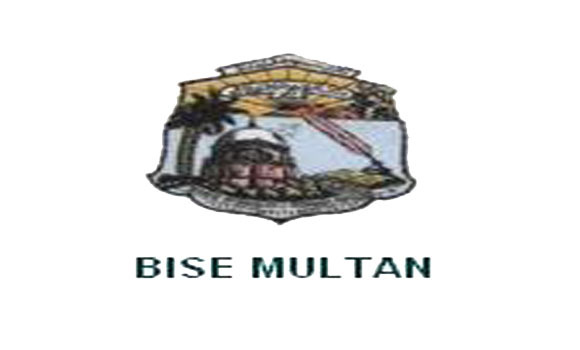 BISE Multan is a board strongly committed to provide a quality and transparency in education as well as in examination system to every affiliated student registered with it. The Board is an autonomous institution with powers to make rules. It does not receive any grant-in-aid or any donation from the Govt or semi Govt agency as well. It has to generate its own funds through the levy of examinations and other fees. Multan Board Inter Date Sheet 2019 is completely ready along with roll number slips for HSSC students. After the issuance of Multan Board Inter Date Sheet 2019 the conduction of examination till the month of June shall be accomplished and the result will also be declared in month of September by the concerned board as well. We are also going to provide you the best preparation platform by giving you guaranteed model papers and online test of all subjects of 11th and 12th class with both science and arts discipline as well. This is the best educational site which guides you in right direction and provides you most authentic and reliable source of information and studying material according to your needs and requirements as well. To hold and conduct examinations pertaining to Intermediate Education, Secondary Education, Pakistani and Classical Languages and such other examinations as determined by the government. To award scholarships, medals and prizes to position holders. To accord, refuse or withdraw recognition to the Educational Institutions. To grant certificates and diplomas to the successful candidates. To fix, demand and receive fee as may be prescribed by. To organize and promote extra mural activities. Private and Regular Candidates are advised to get roll number slips which have been ready to issue from their concerned channel as well.Regular students of Government Schools can get their Roll No slips from their School or as been dispatched to their home address, While Private Candidates can download their Roll number slips from link as being given below. Beside of BISE Multan Board Inter Date Sheet and Roll number Slips, We are also going to provide you proper channel for your annual exam preparation through the Setting of Online Tests of various subjects with respect to Science and arts discipline as well. This online set up for the preparation shall surely enable you to pass your intermediate exam with graceful and remarkable grades accordingly. Students who are afraid from annual examination are strongly encouraged that leave all worries and take this online preparation channel and get guaranteed success. The link for online preparation test and past model papers is going to paste below for you. In order to get good grades give click on prescribed given link.